How to play: You need to upload your project using this week's challenge to your online blog or public photo gallery. Leave a link that goes directly to your project in the Mr. Linky form (this one is on Kristin's blog since we didn't have the site live yet.) If you upload to online galleries, please also use the keyword or tag, JUGS1. After you post to Mr. Linky you can also leave a comment here. And now Just Us Girls present a little inspiration to get you started. 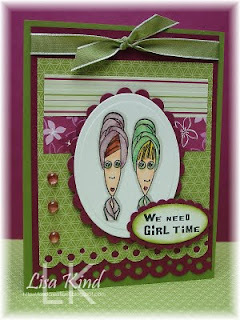 Learn more about Just Us Girls Challenge #1 here. Looks like a fun place to play! wahoo! Looks great! Love the banner! Let the challenges begin!! Well girls - I think you rocked it! I hope we'll have people come and play- I'm pretty sure they will. Thanks for checking it all out. Very cool new challenge blog - best of luck! 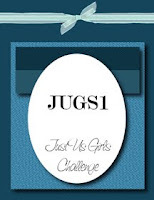 The Just Us Girls Challenge blog looks AMAZING! Looks inviting to me! Thanks for the well wishes Nicki and Sensible :O) We hope you enjoy our challenges as much as we do! LOVE this sketch!! Thanks so much! 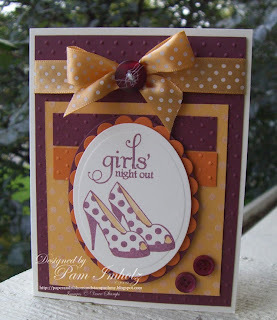 Absolutely love the blog - so sassy! Loved the sketch too - thanks for the inspiration!! What a wonderful blog and congratulations on #100 - way to go.